We woke up this morning to a nice surprise - SNOW! It wasn't a lot but it doesn't take much to have some fun! Nicholas started rolling up giant snowballs. There's nothing like freshly fallen snow to show you just how dirty your white van really is. Rachel watched Nicholas making giant balls of snow and she did a great job on her own. There were tracks all across the front yard from making snow balls. Neither of them really like getting hit with a snow ball so miraculously they both agreed not to throw snow. Instead they worked together on building a snowman. I loved watching Rachel roll snow balls. She didn't have nearly the control over the ball that Nicholas had but she was mighty determined and didn't give up. That is, until she realized that she could EAT the snow! Do you want some, Mommy? They eventually finished building their snowman. They were so proud of him. We took a break inside to warm up by the fire and enjoy some hot chocolate. Before we had gone outside, I ran a pot of plain water through the coffee maker so it would be hot and sitting on the warmer for us anytime we wanted some for hot chocolate. It was nice to just come inside and mix it up. Of course, my little ones couldn't stand to sit inside much longer than it took to drink their hot chocolate. Now it was time to explore the back yard! Nicholas scooped snow from the toy box and took a big bite. Eww, I don't encourage this because I'm sure the top of that toy box was dirty but at some point I gave up on that battle. We have been talking about measurement a lot so we pulled out a ruler to measure the depth of the snow. It was 3/4 of an inch. I love just letting them explore. They always find new ways to play with old toys (and paint rollers). Nicholas came up with a simple little snow catapult idea using a bug net. 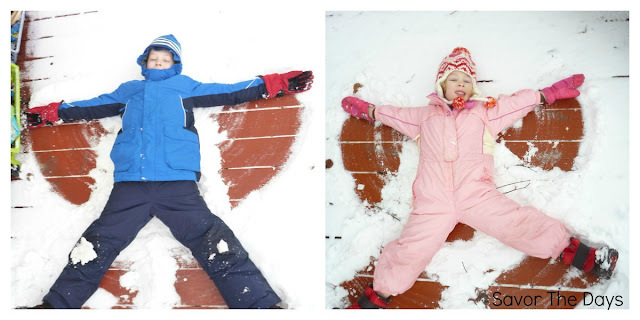 Of course there were snow angels to be made. Nicholas didn't want to snow to stop so he found a big stick and started trying to shake the tree branches to make more snow fall down on him.